A DIFFERENT type of win to the one over Scotland at Twickenham last week but a win nonetheless for England. The wet weather in Dublin dictated that this was never going to be a classic in terms of attacking rugby – the sheer number of handling errors from Ireland putting paid to that idea – but the pure physicality of the contest and the ferociousness of both teams’ defence was somehow absorbing. The kickers dominated – Owen Farrell’s four penalties securing the visitors’ victory – but it was England’s reaction to James Haskell’s yellow card that made the difference. Ireland had started the second half strongly and Ronan O’Gara levelled the scores at 6-6 when Haskell was sent to the sin-bin at a ruck. But this seemed to spark a change in England – they drove the Irish back upfield, kept their discipline and slotted two penalties of their own to secure the win. Mike Brown sent an up-and-under skywards in the 65th minute, Rob Kearney collected it but was brought down by Courtney Lawes, allowing Brown to get over the ball quickly and force the Ireland full-back to concede a penalty for holding on. 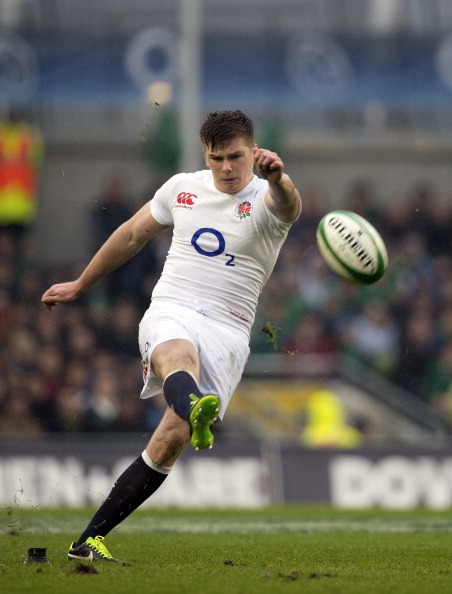 Farrell slotted the points and England were able to hold on to their six-point lead. 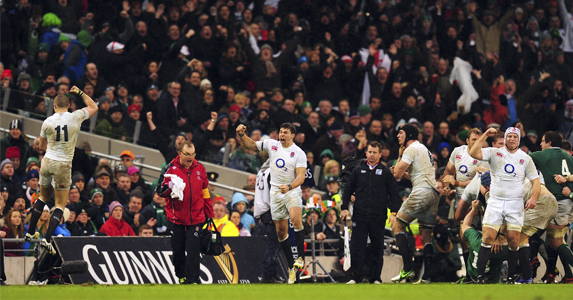 Alex Goode was exemplary at the back for England. Solid under the high ball in tough conditions, he also chose his kicking options well, either gaining territory for his team or putting the Irish under pressure. He presents a threat with ball in hand, too, when he joins the line. The Saracens full-back always seems to make the right decisions at the right time and will certainly have enhanced his Lions prospects. Geoff Parling – The go-to man in the England engine room. He did well in the lineout, put in a massive performance in defence and carried strongly too. Brian O’Driscoll – More glimpses of class (take that first-half pass to Keith Earls) from the Ireland centre and new dad. Plus he showed guts when playing on when in noticeable discomfort. Chris Robshaw – Solid as ever from England’s skipper. He had plenty of involvement in the game and crucially pulled his players together when they were down to 14 men. Cian Healy – The Ireland prop is always an aggressive player but in this match he crossed the line and his indiscipline will be a concern for Warren Gatland (and Ireland if the expected citing happens). Jamie Heaslip – Too many basic errors from the Ireland No 8. Yes, it was raining but players in the North are used to playing in the wet and should be able to hold onto the ball more often than not. Ireland had more territory (57%) and possession (58%) and made more carries (87 to 55) but couldn’t capitalise on those advantages. Mike Brown topped the metres made list for the second week running with 76 while Chris Robshaw made the most tackles with 14. Ireland – Pens: O’Gara 2. England – Pens: Farrell 4.